Charlton Athletic boss Karl Robinson says the Cobblers fans should applaud Ricky Holmes when he makes his Sixfields return on Saturday. Holmes played a starring role as Town claimed the Sky bet League Two title last season. He scored 11 goals in 32 appearances, many of them stunning strikes and matchwinners, and was runner-up to John-Joe O’Toole in the supporters’ player of the year vote. Holmes hasn’t set foot on the Sixfields pitch since the title party following the 2-0 win over Luton Town on April 30 last year, and will be aiming to play a starring role for Charlton this weekend. He is sure to get a good reception from the Cobblers supporters, and Robinson believes that should be the case. “Any time a manager or player gets success at a football club, you have to be applauded when you go back, because you were part of a journey,” said the former Milton Keynes Dons boss. “That club was going into administration. They weren’t getting paid and they went on a very long unbeaten run. Holmes is in tip-top form as he heads to Sixfields, having scored a brilliant hat-trick in Charlton’s 4-3 defeat at Shrewsbury Town on Tuesday night. 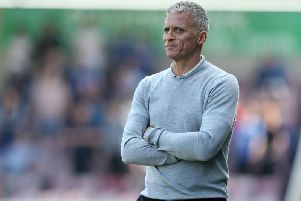 He is fully fit and firing after missing two months of the season with a broken toe, and Robinson is delighted with his player’s form, branding him a ‘tremendous individual’. “If you take away the goals on Tuesday, he was the hardest-working player on the pitch,” said Robinson, who took charge of Charlton in late November following Russell Slade’s departure. Charlton are set to be backed by 1,000-plus travelling fans this weekend. but their number may be lessened slightly as up to 300 of the club’s supporters will instead be in Belgium, to protest against club owner Roland Duchatelet. The protest will take place on Saturday in Duchatelet’s home town of Sint-Truiden, and has been jointly organised by CARD (Coalition Against Roland Duchatelet). “We think in terms of numbers we have 250 going, but that really is a guess because there will be people travelling independently,” said Voice of the Valley fanzine editor Rick Everitt, who is a member of CARD. “Charlton will be taking a four-figure number to Northampton and there will be quite a few there who are disaffected with the regime.